The OABA was formed in 1965 and for over 50 years has been protecting and representing the rights of the mobile amusement industry throughout the United States and Canada. The OABA is involved in representing our members on a wide variety of legislative issues. Not only are we constantly involved with state amusement ride issues, we represent the interests of our industry with other federal and state regulatory entities such as Department of Transportation (DOT), Consumer Products Safety Administration (CPSC), U.S. Department of Agriculture (USDA) with exotic, animals owned by member petting zoos and circuses, Americans with Disabilities Act (ADA) and Occupational Safety and Health Administration (OSHA). OABA monitors state and federal legislation to keep members up-to-date on issues that affect the industry. We work with lobbyists and legislators to educate them on the industry and address the potential impact of legislative proposals. We are pleased to announce that the OABA board has recently retained two seasoned lobbyists in Washington, D.C. to assist the HR & Foreign Labor Committee and the board with advocacy initiatives to improve the H-2B program for the mobile amusement industry. Joan Galvin is a senior advisor with Kelley Drye & Warren in the firm’s Washington, D.C. Government Relations and Public Policy practice group. For over 20 years she has represented client interests before Congress and numerous federal agencies. Ms. Galvin concentrates in the areas of animal, wildlife and environmental law, agriculture, appropriations, and marine science. Ms. Galvin advocates on behalf of client interests before the U.S. Congress and federal agencies, including the U.S. Department of the Interior, U.S. Department of Agriculture and National Marine Fisheries Service. She has worked with the OABA for the past ten years and was instrumental in establishing the World Circus Federation. Prior to entering the private sector, Ms. Galvin served as vice president for Government Relations at Feld Entertainment, Inc., the parent company of Ringling Bros. and Barnum & Bailey Circus and Disney on Ice. On Capitol Hill, Ms. Galvin worked as legislative assistant to former Members of Congress Rep. Andy Ireland (R-FL) and Rep. Larry Hopkins (R-KY), where she served as designated staff to the House Armed Services Committee. A graduate of George Washington University, Ms. Galvin holds a BA in Business, Economics and Public Policy and earned her JD in 1993 at GWU’s National Law Center. Gregg Hartley was the senior staffer and advisor for eighteen years to U.S. House of Representative Roy Blunt (R-MO), the former Republican Whip of the U.S. House of Representatives. As Chief of Staff to the Whip, he was part of the leadership staff who worked for the then-Speaker, Majority Leader, Conference Chair, and seven other leadership offices. From the Republican Whip Office, he directed coalition efforts, working with outside groups in “grow the vote” activities. Mr. Hartley worked in then-Governor John Ashcroft’s Administration, as Blunt’s senior political aide in the Missouri Office of the Secretary of State, and in the first term of the Reagan Administration for a quasi-public agency, the Legal Services Corporation, as Director of Field Services. He also has worked in the banking, mortgage and securities sectors for local and national institutions. Early in his career, he led programs for Legal Aid of Southwest Missouri, Southwest Missouri Office on Aging and the Springfield Missouri Police Department. Recently, Mr. Hartley served for over a decade as Vice Chairman and Chief Operating Officer of Cassidy & Associates, one of the oldest and largest federal lobbying firms in the United States, directing the efforts of thirty-five government affairs professionals and overseeing the professional services rendered to the firm’s many clients. He led teams serving commerce, transportation and financial services clients, including organizations such as The Walt Disney Company, AT&T, Verizon, Bell South, Eagle Picher, Expedia, Cerner, Emerson Electric/Liebert Power, American Airlines, One Laptop per Child and The Doe Run Company. He was highly involved in representing the firm’s international and foreign affairs clients including the Islamic Republic of Pakistan, Equatorial Guinea, and a range of clients in Southeast Asia, the Middle East and Russia. He remains of counsel to Cassidy & Associates. Mr. Hartley holds a degree in Economics and Urban/Regional Planning. He has also studied public administration, planning and business at the graduate level. OABA monitors state rulemaking process, informs members of proposed rules and provides public comment on behalf of the industry. Many of our members serve on State amusement ride advisory boards. The OABA PAC is a resource for members to pool their state and federal campaign contribution dollars together to perhaps have a larger big impact on behalf of the industry. For more details concerning the OABA PAC, click here. The OABA connects members to elected officials. Periodically the OABA will send legislative alerts to members, informing them of pending legislation and directing them to contact their state or federal legislator to send clear and concise industry position to elected officials. The OABA participates in many coalitions and alliances to strengthen our impact and further the policy goals of the amusement industry. 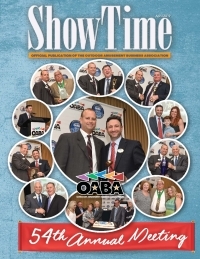 The OABA also participates with other trade associations such as IAAPA, IAAM, contact us for more information.